Thomasine R. Palmer, age 61, of Pleasanton, passed away Wednesday, September 20, 2017 in Jourdanton. She is survived by her son, Carl Palmer of Pleasanton; daughters, Lakeya and Lashauna Palmer both of Pleasanton; brothers, Billy Ray Sheppard Jr. of San Antonio, Michael Brooks of Converse and Deon Sheppard of San Antonio, and sisters, Velma Dilworth of San Antonio, Bernice Sheppard of San Antonio and Annie Montgomery of Dallas. 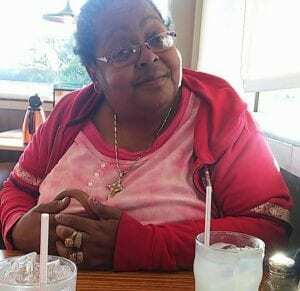 Thomasine is also survived by her grandchildren, Krystopher Palmer, Karl Palmer, Kassidee Palmer, Aaliyah Palmer, Damien Palmer, Donovan Martinez and Daysha Cortez. She was preceded in death by her parents, Billy Ray and Justina (Jackson) Sheppard, and aunt, Dora Montgomery. Visitation will be held at Hurley Funeral Home, 118 W. Oaklawn Road in Pleasanton, from 8:00 AM until service time at 10:00 AM, Wednesday, September 27, 2017. Interment will follow in Jacobs Chapel Cemetery in Pleasanton.